I meant to do a post about what we're using in our homeschool way back in September, and it never happened. 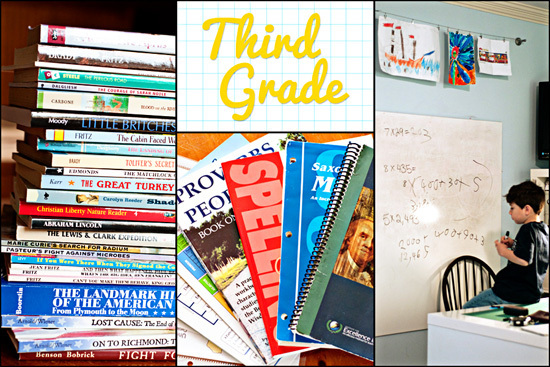 I know that lots of homeschoolers are in the process of making choices and looking for ideas for next year, so it seems like now might be an even better time to share what we've been doing for third grade. Today, I want to share the list of what we have been using this year, and I'll do some follow-up with more details about some subjects and how the Foundations material from Classical Conversations really is the foundation of our study in our home. Handwriting/Copywork - We started the year off with one of the Classically Cursive books from Veritas Press. Now I mainly pull copywork from our memory work or Scripture. I use the StartWrite software to create the pages on handwriting lines to be copied. There are several of these pages that I have laminated because we've used them over and over throughout the year. English Grammar - We use the English Grammar trivium tables from CC, and we recently started working with the Quid et Quo table as well. Basically, we look at parts of speech and parse sentences. We also work on editing exercises to review and reinforce the basic rules of spelling, punctuation, and capitalization. Geography - We use the CC memory work for the current cycle along with the CC maps. We're working on map drawing with the map of the United States. Bible - We're working on basic journaling, and Jonathan is working through Proverbs People. Reading - Books, books, and more books. We use lots of library books, and we did purchase quite a few books this year that aren't available at our library. I like to have a stash for when we can't make it to the library. I like to look at Veritas Press and Sonlight to choose books for our reading list. This may not be exactly what things looked like when we began the year, but I do think I have felt more comfortable with what we are doing this year than any other year so far. I think I would say that having a vision for where we are headed has really helped me to think through what we are doing now and set some basic priorities. I'm already starting to think through our resources for next year because we'll be winding down soon and end our year in early May. Have you begun planning and selecting resources for next year? Do you have something new you would like to try?